Feel free to contact Jeri by phone or e-mail. She will be happy to answer any questions you may have regarding this program or others being offered. Join Jeri O’Hara in a fun class where you will be inspired to get yourself ready for Playing Golf. Review of the basics and individual attention are provided in SMALL GROUPS (4 – 6). Clubs can be provided if necessary. Join Jeri O’Hara in a fun class where you will be introduced to the principles of putting and chipping on an authentic green at the beautiful Northlands Golf Course. Clubs can be provided if necessary. Lesson I – Chipping Stroke: The difference between chipping & putting, which club to use, how to get the ball up in the air, how to get the ball close to the hole. Lesson II – Putting: Alignment, Distance, Direction. See it and sink it. Not only will you be learning the Short Game (putting & chipping) principles of the game in the environment where the game is played but also on and around authentic greens where you will experience every situation that you will on a golf course. (different grass, lies, approaches and conditions) . You will spend your lesson learning “how” to practise what you have learned so that the learning can be transferred to the golf course in a real game. You will learn how to use different clubs successfully for chipping in order to get different results (like you need to do when playing golf). Learn why some people only use one club around the green and others make a choice between several. Learn why some people putt and some people chip. You will learn what different wedges are used for. The short game (putting, chipping, pitching and short irons) represent approximately 70% of your strokes and yet this is the part of golf where there is the least amount of attention paid. You will experience realistic lies, hills, slopes, grass conditions like you find “out there”. Time will be spent assisting you to align the shot correctly paying attention to how “you” see and analyze the situation. Proper set up is covered in order that you can easily execute your putting stroke. The final (3rd) lesson will be a 4 hole playing lesson where you will get to try out your new skills on the course. 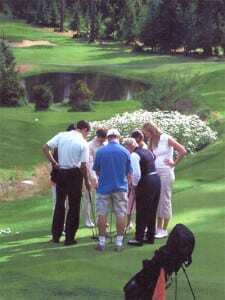 These lessons are conducted approximately 1.5 hours before dusk when the course is quiet. A green fee of $20 will be required for this lesson. Because of the small groups, you will receive individual attention which will help you to gain skills and improve quicker than if in a large group. You will have plenty of opportunity to ask questions.